This September the Palestinians plan to take their case to the UN for the nations of the world to make a vote about the future of God’s own Land Israel, including His City Jerusalem. It will be a crucial test for every nation, where they will be forced to make a decision! Will their decisions be based upon truth… or an appeasement to the Arab and Muslim nations and… for oil? The world media have been talking about the “Arab Spring” referring to popular uprisings in Tunisia, Libya, Egypt, Syria, Yemen and even Jordan. However, these uprisings are not about democracy and peace in the Middle East, but rather this Arab Spring will bring an early winter to Israel in September when the UN votes to form a Palestinian state along the pre-1967 borders. Taking their case to the UN this September is mainly a pretext for the Palestinians to launch another violent uprising against Israel regardless of the outcome of the vote. The Palestinian leaders have always wanted to achieve their own state through violence and bloodshed, like all other “respected” nations, rather than through peaceful negotiations. “With fire and blood we will redeem you oh Palestine” has for years been their rallying cry. The Palestinians want to copy Israel’s 1947“UN partition vote” drama, including taking up arms afterwards to fight for their nation. A recent poll conducted by the Dahaf Institute shows that a majority of Israeli’s think a violent Palestinian uprising will come after statehood bid whether or not UN recognizes their state. The Israeli police have already begun to stockpile rubber bullets and tear gas. Jailed Palestinian terrorist leader Marwan Barghouti recently issued a statement calling for Palestinians to join in a massive uprising against Israel…"I call on our people in the homeland and in the Diaspora to go out in a million-man march during the week of voting in the UN in September." Israel's Deputy Foreign Minister, Danny Ayalon, has produced a new You Tube video in which he presents the historical, political facts regarding Judea and Samaria. We encourage you to watch this very important video by clicking: http://youtu.be/XGYxLWUKwWo then please forward it to as many people as possible including politicians. The truth must come out! Upon the release of the video, the PA put out an official press release claiming that the video was a "cynical and falsified account of history and international law". Chief Palestinian negotiator Dr. Saeb Erakat demanded an official explanation for the video! In the PA press release, Erekat claimed that Israel was accepted to the United Nations on the basis of UN General Assembly Resolution 181. Pushing back Israel to 1967 lines is illegal under International Law! All of the facts above are ignored by the international community in their endorsement of the Palestinians claim to a sovereign state of their own based on the borders of June 4, 1967. We are certainly involved in a battle for the truth! In May, US President Obama added to this pressure on Israel. He stated the official US policy is that Israel is to create a Palestinian state based on the 1967 borders, which means dividing Jerusalem! He agreed with the Palestinians and most nations in the UN. The President actually made two speeches in May. The second was on May 22, and during this speech, he reaffirmed the dividing of Jerusalem. Within hours of his second speech, a powerful tornado storm tore through Missouri and devastated Joplin. It was one of the most destructive tornadoes in US history with high loss of life and $ billions in property damage. The key is this storm hit just a few hours after the president’s speech to divide Israel. It is very disturbing to know that the United States, a nation that promotes world peace and is against terrorism AND… a close alley of Israel, has for several years been training a Palestinian military army at the cost of 100 million dollars per year. General Keith Dayton declared in 2009 that he expects the Palestinian army that he has trained will be used against Israel if they do not get their own state by 2011! His PA army now has 30.000 professionally trained troops with the absolute best equipment possible, far better than what Israeli soldiers have. Thus, Obama has set the tone for the UN meeting in September by demanding the Palestinian borders include most of Judea and Samaria and with East Jerusalem as its capital. What are the implications of enforcing pre 1967 borders? There are two clear points that must be made: 1. Israel becomes virtually defenceless if these borders are enforced. 2. These borders are illegal according to International Law. Swapping land for peace does not work! In 2005, Israel withdrew from Gaza under the terms of the Oslo agreement which was supposed to bring peace but instead it brought over 10,000 rockets fired indiscriminately into Israel and a flurry of activity smuggling arms from Egypt using tunnels. The 1948 borders are the ones approved by the UN and should stand. Equally, Palestinian Arabs were given Jordan as their homeland and this should stand. There is absolutely no need to create yet another “two state” solution as one already exists. President Obama “seems” naive and ignorant of Islam and its designs on Israel and that it would leave Israel virtually defenceless if these border changes are made. The free world has swallowed the big lie that Israel has no right to its land and President Obama is set to put the “nail in the coffin” in September at the UN meeting. Both the UN Secretary General and President Obama have called for Israel to surrender. UN Secretary-General Ban Ki-moon reiterated that the world body expects Israel to immediately surrender to internationally back Arab demands that it relinquish all claims to the Jews’ biblical heartland of Judea and Samaria and half of their ancient capital of Jerusalem. The Jewish presence in the so-called “West Bank,” which includes the eastern half of Jerusalem, is “morally and politically unsustainable, and must end,” Ban Ki-moon insisted during a press conference in Uruguay. The Arab world already has a simple majority for the vote, having 110 nations supporting the “Palestinian state”. Only President Obama has a right to veto but he probably is unlikely to do so. The truth is that under International law, Israel’s boundaries have been set at the land west of the Jordan river and include Samaria, Judea, Gaza, Golan Heights and all of Jerusalem. Arab nations started an illegal war in 1948 which they lost and the territory recaptured in 1967 only restored the status quo. Palestinians already have a state decided in 1946 and it is called Jordan! International law should be respected… so therefore ~ Samaria, Judea, Gaza, Golan Heights and all of Jerusalem legally and rightfully belong to Israel. By supporting the UN vote will surely bring on war in the Middle East which could easily become a global conflict. Times are very serious…! It is now important than ever before that we become firmly established on the truth of God’s word, preparing to take a stand in PRAYER and ACTION to defend Israel in incoming days. Israel’s military leaders are anticipating another regional war soon, not just against the Palestinians but also involving Lebanon, Syria and possibly Egypt. The Bible lists three specific land purchases by the national ancestors of the Jewish people in the very area (God calls it Judea and Samaria)… the Palestinians are now claiming this land for their state! Abraham bought, the Cave of Machpelah (Hebron) legally; for four hundred shekels of silver in Genesis 23 and in Genesis 33 Jacob bought Shechem (Nablus) legally; for four hundred pieces of silver and in 2 Samuel 24 David bought the Temple Mount legally… in Jerusalem for fifty shekels of silver. We are reminded that the title deeds to these areas are written in the Holy Scriptures. The Bible is very clear about Judea and Samaria, the area which world media calls the West Bank. Ezekiel 36, God also calls this area “the mountains of Israel” and “My land.” God specifically says about this area…“this is what the Sovereign LORD says: In my burning zeal I have spoken against the rest of the nations, and against all Edom, for with glee and with malice in their hearts they made my land their own possession so that they might plunder its pastureland.’ Therefore prophesy concerning the land of Israel and say to the mountains and hills, to the ravines and valleys: ‘this is what the Sovereign LORD says: I speak in my jealous wrath because you have suffered the scorn of the nations. Therefore this is what the Sovereign LORD says: I swear with uplifted hand that the nations around you will also suffer scorn. In September 2008, President Bush (Junior) was trying to divide Israel and Jerusalem. In the midst of this effort, Lehman Brothers collapsed resulting in a stock market crash. What was amazing is that the crash occurred on three specific days… which all fell on Biblical Fall Feasts! At the very time the President was moving to divide Jerusalem, the US and world economy was crashing! On September 29, the great stock market meltdown of 777 points took place. This day was also the Biblical Feast of Rosh Hashanah, the Jewish New Year. This 777 point fall was the greatest one-day crash in history. The next biblical holiday, Yom Kippur, or the Day of Atonement, takes place ten days after Rosh Hashanah; this ten day gap between the two holidays is called the “Days of Awe.” During the “Days of Awe,” the world markets began to collapse until, on Yom Kippur, October 9, then the market fell 679 points for the third greatest one-day crash. The next Biblical holiday, the Feast of Tabernacles, fell on October 15. On that day, the stock market fell 737 points for its second-greatest one-day fall. On these three Biblical holidays, the market dropped a total of 2,193 points! To this very day, the US economy has not recovered! The UN General Assembly will be meeting again this year in mid-September and should be discussing and debating the “Palestinian state” near the end of the month. It is important to take note: The Biblical holiday of Rosh Hashanah falls this year on September 28 which is the very time the UN will be debating this issue! Yom Kippur then falls on October 7, while the Feast of Tabernacles is on October 12. Is it a co-incidence? As the UN meets once again to divide the land of Israel this September… that the same scenario of 2008 STOCK MARKETS CRASH is happening again? If the UN General Assembly recognizes a Palestinian state, it will put these nations in direct conflict with the Holy God of Israel. In the past, this has resulted in awesome disasters. The United Nation’s debating the dividing of Israel and Jerusalem IS in fact a direct violation of the Word of God. Yeshua (Jesus) is coming back to a united Jerusalem, under Jewish control, as the capital city of Israel ~ NOT “Palestine!” He is coming back to be the Lord of Lords and the King of Kings to rule over His Fathers Kingdom. He will sit on the Throne of “David” which will sit where the Holy of Holies sat in the Temple on the Temple Mount. The devil hates even the thought of it. He is doing his best to prevent the second coming of Yeshua and this attempt to create a state other than Israel on God’s land is the devil’s work. The Holy Land today is filled with violence. One peace plan after another is proposed and quickly they all fall apart. With every cease-fire comes another round of terrorist’s attacks on Israel. In vain, the politicians and the nations attempt to find a solution to the Arab-Israeli conflict. Will they keep on finding “solution” after “solution” until eventually once again they establish the “final solution” like Hitler did during World War II. Known in the Bible as Judea and Samaria, but referred to as the “West Bank”… or even the “nation of Palestine” (though no such country has ever existed in history), the plan seems to be that by the creation of an Arab state that there will be peace at last in the region. The belief must be that terrorism will cease and that the Arabs and the Islamic world will finally be able to accept Israel as a neighbour in the region. The Bible, however, presents a much different scenario for the end times. What motivates the US President to sign on to a plan to divide the land of Israel and Jerusalem? He is supposed to be a Born-again Christian, right? He should understand Biblical prophecy shouldn't he? “Replacement Theology,” teaches that Israel has been replaced by the Church as God's people. And if this is his mindset we believe that he can not fully see the importance of taking Scripture literally in regard to God's prophetic future for the nation of Israel. Today, even by some in Israel, there is little regard for what the Scriptures say regarding Jerusalem; “If I forget you, O Jerusalem, may my right hand forget her skill” (Psalms 137:5). We personally would not like to be the one who proposes DIVIDING Jerusalem -- it is against God's Word to do so! Do not touch what God has blessed! Zechariah's words are clear... God will return to Jerusalem and destroy the enemies of Israel, establish His earthly Kingdom and receive worship by His people. “And in that day I will set about to destroy all the nations that come against Jerusalem. I will pour out on the house of David and on the inhabitants of Jerusalem, the Spirit of grace and of supplication, so that they will look on Me whom they have pierced; and they will mourn for Him, as one mourns for an only son, and they will weep bitterly over Him like a bitter weeping over a firstborn” (Zechariah 14: 9 - 10). These events of course have never yet happened in history. So, some Christians believe that this prophecy cannot refer to future, literal events. What they do here is they spiritualize the promises to say they are being fulfilled in Christ's Church today. To them, the Church is the “new Israel,” and Christians have replaced the Jewish people in God's program. Replacement Theology teaches that Israel, through disobedience and unbelief, has forfeited any future in God's promises and that the Church inherits the promises in a spiritual form. However, it teaches, the Church does not inherit the judgments, that they say belongs to Israel! Meanwhile, The Jerusalem Post is reporting that Israel is already considering annexing major settlement blocs, restricting water and use of Israeli ports if a unilateral Palestinian state is called for by the UN. This, of course, will cause an all out war against Israel by her Arab enemies. The Jewish people really have NO choice, given the circumstances and will have to fight for their survival once again… The Arabs, the UN, the EU and the entire anti-Semitic world know this. They will use the same excuse they used to bomb Libya, the “responsibility to protect,” to attack Israel. They are deliberately pushing for a war with the Israel and like Satan, thinking this time they can win. But, Israel will prevail again because the God of Israel is watching over them, and has an eternal covenant with the remnant of Israel and who is mightier than any military force that will come against this land. And, still the Arabs, who haven't learned their lessons after losing three major wars that they started against Israel, will lose once again. Even though the Bible warns the nations NOT TO DIVIDE the land of Israel as there will be severe consequences from God Himself… God's Word tells us the nations of the world will do exactly that in Joel 3:1 – 2. The Book of Joel is a wake up call and a trumpet call to Israel and the Church. It is also a message of warning to the nations ~ and a very sobering message at that. As we look at what is going on between Israel and the nations of the world, it's easy to see that the nations of the world are swiftly headed for severe judgment by God! The Lord is going to judge the nations for at least Five reasons: 1. 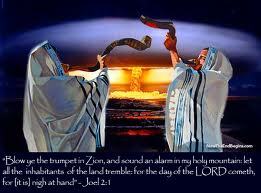 For scattering Israel and the Jewish people among the nations (Joel 3:2) 2. For dividing up the land of Israel, which the Lord describes as “My land” (3:2). 3. For selling the Jewish people into slavery (3:3,5) 4. For stealing treasures from the Lord (perhaps from the Temple), and from Israel (3:5) 5. For murdering Jews and shedding Jewish blood (3:19, 21). Some of these are atrocities that various nations and empires have committed against Israel and the Jewish people over the centuries. Yet some of these are atrocities that will be committed against Israel and the Jewish people during the “time of Jacob’s troubles” (Jeremiah 30:7), also known as the Tribulation.